In today’s post I’m excited to share the story of a recent Mindbreeze deployment. One of our long-time customers, a global leader in the field of industrial automation, needed a replacement for their expiring Google Search Appliances (GSAs). They had used the GSA to power the search on their public-facing website as well as their employee intranet. When Google announced the GSA’s end of life, they were left in a need of a replacement. Due to its similar feature set and architecture, Mindbreeze offered an easy migration from GSA and allowed existing customizations to be reused. Working with Fishbowl to implement Mindbreeze went very well. The expertise they brought enabled us to meet our aggressive timeline to remove the Google Search Appliances. Fishbowl’s knowledge allowed them to be flexible to our needs during implementation while still covering all the necessary material. We appreciated that. In order to provide comprehensive website search, this organization needed to index content from three different sources. First, they needed to crawl the HTML pages on the site itself. Second, they needed to index records in their parts and products database. And third, they needed to index PDFs and other supporting product documentation stored in Oracle WebCenter Content (their document management system). In order to serve their sales and distribution partners, they needed the option to restrict a subset of this content to only logged-in partners. This organization had previously integrated GSA search results into their website using a custom-built search interface which consumed the GSA’s XML response. They planned to reuse the front-end components of that integration while replacing the backend with Mindbreeze. For the intranet search, they needed to index secure documents from Oracle WebCenter Content. WebCenter Content was also the platform through which the secure results would be served to employees. The search results on the intranet needed to include both the access-controlled internet documents, as well as the customer and partner-facing documents that would also be accessible from the website. We began the implementation by configuring Mindbreeze to index the necessary data sources. Each of their three content sources required different indexing tools. The approach was similar to how the same data had been previously indexed using the GSA. First the Mindbreeze web crawler was configured to crawl the site. We were able to reuse the crawl patterns already defined when configuring the GSA. Next, content from their parts and products database was indexed using the Mindbreeze Data Integration connector. This connector uses the Talend ETL platform to create jobs that extract, transform, and load structured data into Mindbreeze without a custom connector. In this case the data integration job was configured to connect to the same tables they had previously indexed with the GSA Connector for Databases. Finally, indexing was configured for the documents stored in Oracle WebCenter Content. In order to index WebCenter Content, the customer purchased Fishbowl’s Oracle WebCenter Content Connector for Mindbreeze. 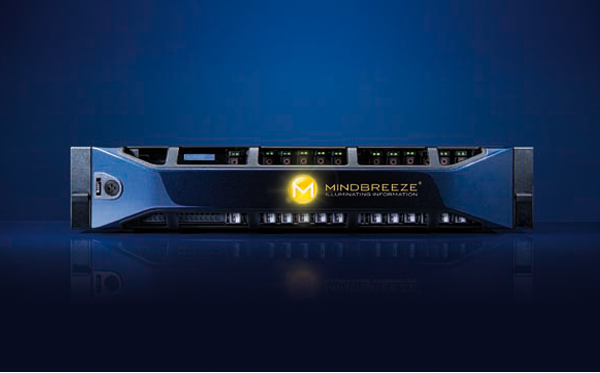 Unlike GSA, Mindbreeze connectors can run directly on the appliance and do not require any off-board connector servers. The connector is deployed via a Mindbreeze plugin and corresponding WebCenter Content component and leverages the Mindbreeze connector framework. The indexing criteria had already been determined during the GSA integration and was able to be copied directly into Mindbreeze. Items from Oracle WebCenter Content were separated into three groups—public content, partner-only content, and secure intranet content. These content groups could then be restricted based on the various serving configurations. The Mindbreeze application was a step up from our previous search application. We had no problems crawling multiple data sources (website, database, WebCenter) and serving that content to multiple front ends. Although there was an initial learning curve, it is easy to edit configurations and rebuild indexes with very little or no downtime. And the onboard analytics make troubleshooting issues a breeze. Once indexing was configured, the results needed to be integrated into the website and intranet. Mindbreeze provides a REST API which returns results in JSON format. This integration is comparably easier than working with the GSAs XML or XSLT responses. Because this customer had already written an integration to facilitate communication between the GSA and their website, built using Adobe Experience Manager, they were able reuse their existing site’s search interface. Search requests to the GSA were replaced with calls to the Mindbreeze search API. This integration also controlled the scope of the search based whether or not a user was allowed to access partner-only content. For the intranet, the results were embedded directly into the Oracle WebCenter Content web application. The customer leveraged the default Mindbreeze search interface, but customized the look and feel using their own style sheet. This gave them the look of a tightly integrated search page but required less than an hour of development to implement. In order to provide secure search, the Mindbreeze authentication mechanism included with the connector was configured. This mechanism passes the identity of a WebCenter user to the Mindbreeze appliance at serve time in much the same way as security search was previously configured with GSA. The Mindbreeze appliance then uses this identity to resolve the access control lists (ACLs) placed on the documents during indexing. This approach is similar to the early-binding options available with the GSA and allows granular access controls to perform well at scale. The entire project from racking the Mindbreeze appliance to releasing the solution in production took 37 days—although the total days of work effort was considerably less. This project focused on one-to-one replacement of GSA functionality to ensure completion in time for the customer’s upcoming Google Search Appliance expiration. Initial user feedback indicates improved relevancy compared to the previous GSA integration. Future enhancements include implementing rich search suggestions and document previews to further enrich search capabilities. If you have a GSA approaching expiration, we believe Mindbreeze offers the quickest and most reliable search replacement path. As a Mindbreeze partner, we offer both resale and implementation services, and as a long-time GSA partner, we’re familiar with the functionality of both platforms. If you have questions or would like to know more, please contact us or leave a comment below.